10/4/2009–Wilmington, NC–Civil Air Patrol Cadet Andrew Dahms was promoted to 2nd Lieutenant during a recent encampment at Camp Lejeune, North Carolina. 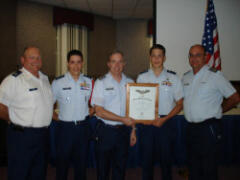 Wing Commander Col. Roy W. Douglass attended as Andrew was presented with the Billy Mitchell award. Among his achievements, Dahms has served as the Cadet Commander for the Cape Fear Composite Squadron, and was presented with the Outstanding Cadet Achievement Award in 2008. Currently, he is a member of the squadron Color Guard and serves as the squadron’s Cadet Drug Demand Reductions Officer. He holds certifications in First Aid, CPR, Blood-borne Pathogens, General Emergency Services, Urban Direction Finding, and Ground Team (II). He earned his Community Services Ribbon doing prison ministry. Upon becoming a cadet officer, Dahms now has the opportunity to apply for academic scholarships as well as to take on greater responsibilities within CAP. The General Billy Mitchell Award, named in honor of the aviation pioneer, advocate, and staunch supporter of an independent air force in America, was established in 1964 to recognize the outstanding achievement of Civil Air Patrol cadets. This is the first milestone of the Cadet Program. This structured program is divided into 16 segments called achievements, involving study and performance in the program areas of leadership, aerospace education, and physical fitness. The Billy Mitchell Award is earned after completing the first eight segments. Andrew had to pass a comprehensive 100-question examination covering leadership theory and aerospace topics. Cadet Dahms is a home-schooled junior who resides in Wilmington,NC with his parents, Edward and Alanna Dahms. Alanna Dahms is a Senior Officer, and brother Robert Dahms is also a Cadet Officer.